Changing your oil can be a hassle, and it is the most overlooked and ignored vehicle maintenance service out there. The public largely assumes that getting your oil changed is not important and that they can get away with doing it less than the suggested intervals, but the honest problem is that following this belief will guarantee that your vehicle will need more repairs more frequently. Not that we won’t help you if your vehicle breaks down, but we prefer that you have a safe and inexpensive driving experience. If your oil is not changed regularly it can become dirty and will cause friction on the gaskets and seals of your engine, causing damage to the engine as a whole. 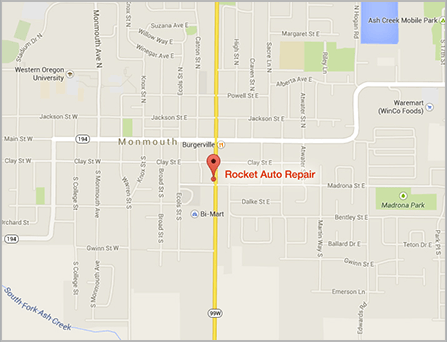 While Monmouth has many destinations for getting your oil changed, Rocket Auto Repair is the clear choice. We have a designated staff member to perform oil changes in order to get you back on the road as quickly as possible. Our ASE certified technicians are experienced with repairs and oil changes for cars, trucks, and SUVs. We pay close attention to your vehicle’s specifications for which oil it needs, whether it is regular, semi-synthetic, or synthetic oil to ensure that it will run as smoothly as possible. Bringing in your vehicle for any type or repair or service can be a hassle. At Rocket Auto Repair, we take the hassle out of getting your oil changed and will keep you entertained in our cozy waiting room while we service your vehicle. If you are unable to wait, we offer a drop-off service and you are welcome to come back at a later time for your vehicle. Give us a call today and schedule the best, most convenient oil change Monmouth has to offer.